Political correctness‘ quota nonsense gives us firefighters that are too weak to carry an injured person and too dumb to read maps and street signs. Gender and racial quotas are equally harmful, unjust, and outright dangerous. Feminist gender "equality" sets fire fighters’ physical standards lower, so the average woman can pass. Safety be damned. "I have a family," another fireman said. "I can’t count on a 110-pound female to carry me out of a burning building." Maybe it’s me. But if I were to be caught in a fire, I’d feel a lot safer in the arms of a 6-foot man than those of a 5-foot girl. You can’t choose the one who will rescue you. You can weaken the pool. And that is something this city can’t afford in the name of "diversity." Unfortunately, MRA (men’s rights activists) are unaware that male gender quotas are quite similar to racial quota issues. What is falsely perceived as discrimination is to be remedied. if there is a desire to institute quotas, compensate weaknesses with extraordinary skills. Those who underperform at IQ and aptitude tests will only be hired if they strongly over-perform at physical tests, and are aware that they will not be apt for leadership positions. Women who underperform in brute strength of lifting heavy weights may compensate with extremely high scores in speed, endurance, IQ. 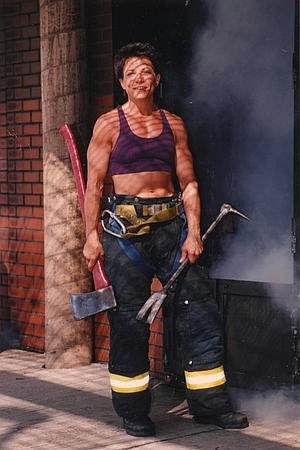 In police, army, and fire fighters physical fitness demands are lowered for women. These then will be unable to lug a heavy log, an injured man, or break into jammed doors. In reality, when the going gets rough, then MEN will have to pick up the slack and do the work the women can not do. What Merit Matters supports is a color-blind, gender-blind set of written and physical entrance exams that hold EVERYONE to the same rigorous set of standards. There’s absolutely no way to argue that that isn’t what’s best for the FDNY and all the people of the City of New York. Now recently, the Fire Department of New York was forced to hire Blacks with low cognitive skills who might not be able to read street signs, or maps, or understand the logistics of evacuating a building. It was alleged that a multiple choice test that tests 10th grade reading and cognitive abilities discriminates against Blacks. This is true due racial differences in iq. Due to lower IQ and lower educational attainment, fewer Black applicants can pass the test that requires 10th grade proficiency. It is ridiculous to claim that a multiple choice basic education test discriminates against Blacks for their race. it discriminates against them for their substandard general education. And yes, there are Blacks that pass the test with a perfect 100 score and deservedly get hired. This is an open book test. They tell you that a fire extinguisher has to have 100 lbs pressure, and then 4 lines down ask you to what pressure to fill up a fire extinguisher. And the judge wants every Black/Hispanic to be hired that scores 25% on a 4 questions multiple choice test. That is what an illiterate scores by blind guesses. Yes, for fairness this test will also permit to hire dumber white applicants. The 37-year-old, who made $123,699 in 2018 at Engine Co. 234 in Crown Heights, has a history of alleged violence against women. Last January, Phillips was arrested for assault and harassment after allegedly punching an ex-girlfriend, Teszra Cody, in the face at a midtown Duane Reade. The attack was reportedly captured on surveillance video. Afterwards, the restraining order was issued. Phillips is a former subway engineer who fraudulently took a family leave from the MTA to attend the Fire Academy in 2014, officials said. He was the lowest-scoring of 282 “priority hires” ordered by a Brooklyn federal judge who ruled that minority candidates were victims of race bias. “The letter does not say that the city intended to discriminate against any individual or group, but rather that the difference in pass rates between African-Americans and whites was the unintended effect of a neutral testing process,” the city contends in a news release. Imagine. You are a fire fighter, 5 years into your career. And suddenly a guy that flunked the exam becomes your supervisor, with a higher salary, and gets 5 years salary as a present. This incompetent guy then will give you orders. If women with to fill jobs that men have traditionally done they must meet the same standard. If they can do that then no problem. If not you are setting people up to die or fail when needed most. You make good points. Policies such as affirmative action necessarily lead to an inferior country and, ultimately, the downfall of civilization. Video of Women in Fire Training Assailed : Personnel: Tape shows female recruits having trouble with physical tasks at academy while men do well. Los Angeles city officials call for inquiry into its making. Then came a notorious video dubbed the “Female Follies” by the media. In it, a handful of women, including a perfume saleswoman from Macy’s and an 18-year-old babysitter, were seen awkwardly struggling to climb over a 5-foot wall. The video was reportedly leaked to the media by a furious female captain and resulted in intense criticism of the male instructors who made it. But almost nobody — including the media — asked whether the women could actually perform the drills. The Weekly has learned that the 25 women who were in training at the time of the “Female Follies” were given special pay for months by the city — unlike the men in that same class — to undergo extra preparation before facing the academy. The political flap over the imagery of flailing women — although it was an accurate representation — led to the forced retirement in 1995 of Fire Chief Manning. City Councilwoman Goldberg rode the controversy to full effect, claiming that the department was a “paramilitary” organization full of sexist white men. But there was virtually no discussion of whether women could handle, or even wanted, the work. In 1996, Bamattre was hired as chief by Mayor Richard Riordan, to try again. Bamattre hired far more minorities, but built the count of women to only about 83 — a number that included many paramedics who did not fight fires. Paper and pencil tests, and fitness tests have nothing to do with firefighting capacity, he claims. Too bad that any test that measures intelligence is considered rigged against Blacks. While fire fighters might get away with brawns compensating for brains, the officers really ought to have intelligence. The Supreme Court decided that White firemen (oops firefighters) should be promoted even if there were no Blacks among the best in the test (Ricci vs DeStefano). Firefighters leaders don’t need intelligence, cognitive and reading skills. Such is the PC opinion that endangers lives. See comments at Libertarian reddit. I think we need this judge to look into the racist NBA and order them to limit blacks to 12 percent of these lucrative positions – the percentage blacks reflect in the general population. Clearly, due to the very disproportionate number of blacks in the NBA, their hiring methods are discriminatory. A perfect example of why this country is going to Hell in a handbasket. How about the same for engineers or doctors. Never mind if the bridge collapses because of incompetent design, we at least will have an adequate number of minorities designing things. here is an actual test. If you cannot answer these questions, you can not function efficiently as a firefighter. You can not learn, you can not put on your protection gear in the right order, etc. I post this, belatedly, at the end of the article as this is very relevant. To see the original test and how easy it is to pass. If you have 10 grade reading level and minimum intelligence. Otherwise you endanger yourself, your colleagues, and the population you are supposed to save. One should not send the three stooges to save people in a fire.